Sylvan Beach Amusement Park features tons of rides including The Screamer. This ride starts at the shore and takes up to 40 passengers on a high-speed boat ride around the lake. 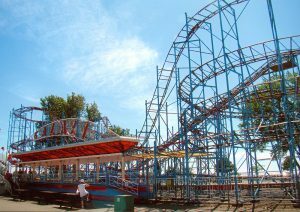 Other rides available at the park include the Himalaya, the Rotor, the Superslide, the Rock-o-Plane, the Crazy Dazy, the Bomber, Laffland, the Tilt-a-Whirl, the Galaxi Coaster, Bumper Boats, Bumper Cars, the Scrambler, and the Tip Top. In addition, the park features 10 kiddie rides especially for children. Sylvan Beach Amusement Park also has a number of game areas. At Playland, the park has Fascination games, one of the few operating Fascination parlors in the United States. Fascination is a predecessor to skee ball, another game found at Playland, along with pokerino, three in a line, and other classic games. Nearby, guests can visit the Bonanza Shooting Gallery, a western electronic shooting gallery, as well as Sportland, which has Bowler Roller, Gun Ball, and other games and the Arcade, which has video games, as well as traditional games for children. Other game areas at Sylvan Beach Amusement Park include Treasureland and Lakeshore Games. Kiddieland Unlimited Ride Band* - $14.95 UNLIMITED KIDDIELAND RIDES FREE SPECIAL EVENTS FREE CONCERTS FREE BEACH ACCESS *Height & Weight Restrictions Apply *Excludes Bumper Boats Kiddieland rides are intended for small children. Other Specials & Coupons To view Sylvan Beach Amusement Park Special Events, go to their special page by clicking here. Sylvan Beach Amusement Park updates this page throughout the year, so check back to see if new specials and coupons have come in. Note to our visitors Sylvan Beach Amusement Park coupons and specials can change without notice. So please visit their official website to make sure of the latest pricing and coupons.